Five (5) more hands have been added to the Giant Hands Around The World Collection, which now contains 188 hands from around the World. A giant hand giving 3-fingered salute, located opposite the Dubai Opera, close to the iconic Burj Khalifa Tower, Dubai. Known as "Win, Victory, Love" - the 3-fingered salute was introduced by Sheikh Mohammed bin Rashid, the ruler of Dubai. The three fingers taken together depicts 'W' for Win, the middle and forefinger represents 'V' for Victory and the forefinger and thumb shows 'L" for Love. The symbol is commonly referred to as Sheikh Mohammed’s three-finger salute and symbolize; Work Ethic, Success, and Love of the nation. German sculptor Gunther Stilling loves to create metallic body parts. This is one of the many hand sculptures created him. Made of aluminium, it is located in front of Karl Marbach GmbH & Co, August-Häußer-Straße, Heilbronn, Germany. 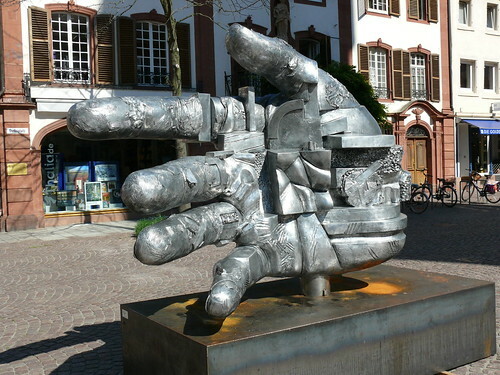 Another hand by German sculptor Gunther Stilling, located at the Collegiate Church (Stiftskirche). It is often called Public (Öffentliche) Hand. 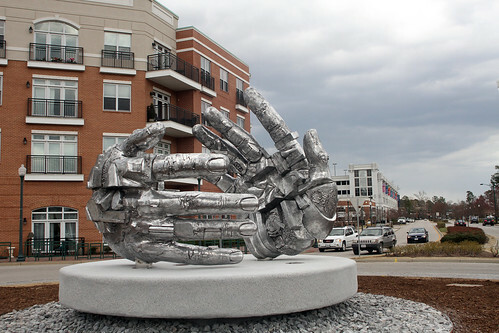 The sculpture entitled "Handshake" is located on a round about near the City Center at Oyster Point. It is made from cast aluminium with an interior stainless steel frame. Each hand weighs 272 kgs (1,200 pounds).